"My family always complained that baked goods that were kosher for Passover tasted terrible, so I took my regular brownie recipe and created a flour and leavening-free version that tastes just as good as the non-Passover version!" Preheat the oven to 350 degrees F (175 degrees C). Grease an 8x8 inch square pan. Melt the butter in a small saucepan over medium heat. Remove from the heat and stir in the unsweetened chocolate. Set aside. In a medium bowl, beat the eggs and sugar with an electric mixer for about 5 minutes. Reduce the speed to low, and pour in the chocolate and butter, then stir in the vanilla. In a separate bowl, stir together the matzo meal, potato starch and salt. Use a spoon to stir into the chocolate mixture until well blended. Mix in the walnuts or chocolate chips if using. Pour into the prepared pan and spread evenly. Bake for 25 minutes in the preheated oven, until the brownies are dry on top and begin to pull away from the sides. See the easiest way to make dense, chewy-style chocolate brownies. This was the best Passover dessert ever. The only difficulty was getting it out of the pan. Wonderful!!!!! These were wonderful. My family were surprised how "normal" they tasted! People kept sneaking more after the table was cleared. This was amazing! That is all that I can say! Congradulations on finding such a good passover recipie! I think that I will use this even after passover! Great recipe and always a hit! Put in chocolate chips and walnuts. made these for last nights seder and they were awesome!! would not change a thing - great just the way they are. 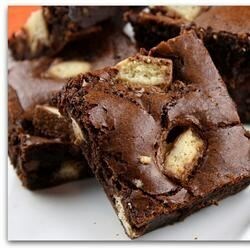 I have made theses brownies for several years now and they are ALWAYS a hit; very easy to make. Probably 5 stars for a Passover recipe and 3 for a regular one so I give it 4. :-) Followed directions except to use a 9x9 and cook for 5 minutes less.